I adore all those spring bulbs that take up permanent residence in the garden. I have written extensively about establishing narcissus, tulips, hyacinths, bluebells and snowdrops. 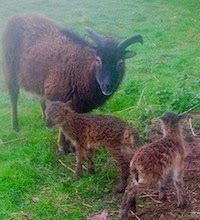 My recent post about establishing bulbs in Lyndi’s field is almost my most popular ever! I am sorry to repeat myself that success in naturalisation comes readily to the none digger. It is he who has glorious carpets of Cyclamen hederifolium and coum. Bulbs go dormant and get forgotten out of season. Only the very most vigorous subjects withstand careless disturbance. (Although I might mention Peter Williams mistakenly stirred around his Dicentra cucullaria and now has a magnificent clump and I know of a commercial grower who lightly rotatavates his snowdrops in summer every few years to propagate them). Undisturbed clean soil, gravel mulched zones and light grassland are the places for naturalisation. 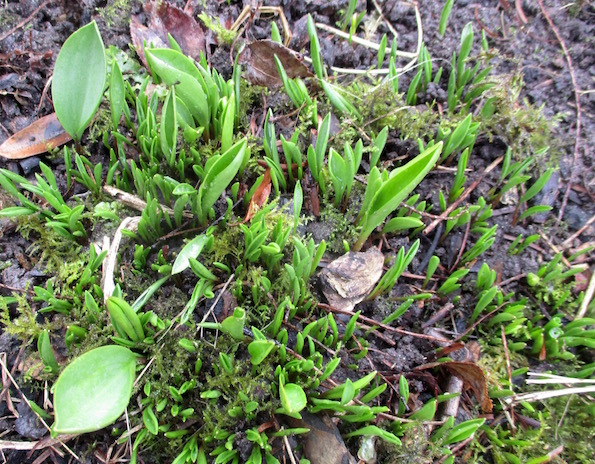 Coarse grass is too competitive for most bulbs but thin grass in woodland might work very well. So too where in the popular fashion low grassland fertility is maintained for ‘wild flowers’. I must admit such starvation goes against the grain with me and this year I lightly scattered fertiliser over my Cyclamen coum! Some of you will know of my current enthusiasm for creating pure stands of Chewings Fescue grass. In such swards I expect naturalised bulbs I have recently planted to do very well. Although my emphasis today is to encourage those bulbs that self seed almost all bulbs are best first established as a result of vegetative propagation. With a sufficiently generous budget you can plant thousands of bulbs and cover the ground in a single season! It is much more satisfying to let natural division and where possible self seeding increase your stock every year. The most beautiful stands take decades to establish. 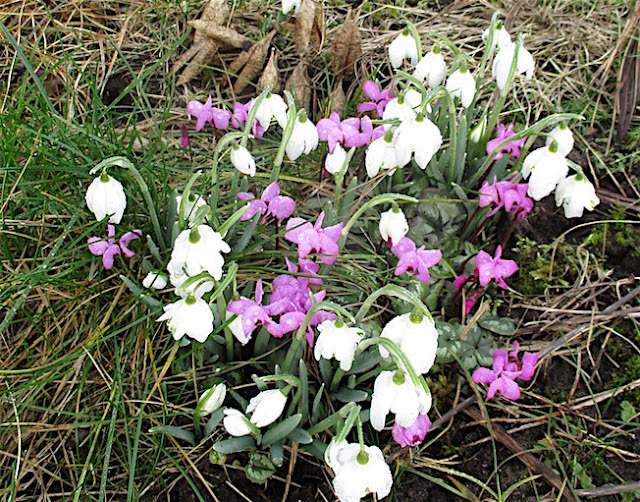 Some famous collections of snowdrops have been there for more than a century. Although snowdrops are an example of bulbs that can seed themselves you will find most stands are at least in part genetically uniform. This indicates vegetative spread with the help of rabbits and other natural disturbance. Crowded snowdrops (and bluebells) get pushed to the surface and nature does the rest. 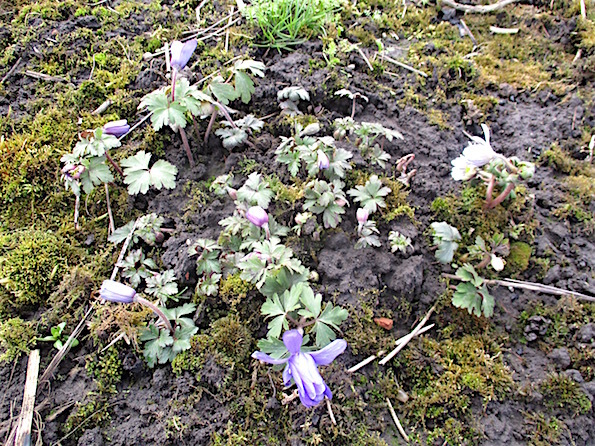 Peter Williams' aconites have self seeded in his path. The list of bulbs that seed around freely is not a long one but the few that do are very worthwhile. There are several species and distinct cultivars of scilla and chinodoxa that cover the ground with flower after just a few years. My own personal favourite is Scilla biflora, readily available as bulbs to get your stock going it is extremely prolific. Spread by ants many gardeners have Cyclamen neapolitanum all over and if it likes you Cyclamen coum too. If you are very lucky you might get winter aconite going. It does not take many years for you to curse an excess of bluebells! You will need to be very patient for Fritillaria meleagris to clothe your wet areas; not so chives which grows like a weed. Beware real weeds such as ransomes and certain alliums! The secrets to successful self sowing is to allow your bulbs to completely die down without cutting or tidying debris away, to have excellent weed control, accurate recognition of seedling bulbs and not stirring the soil after the tiny new bulbs die down. There are several bulbs that set fertile seed but do not successfully self sow. There might be serendipity factors such as insufficient seed volume, variable weather conditions and excessively dry soil. Such seeds are best collected and sown in a seed tray. I do this for fritillarias and Narcissus romeuxii and in the past cyclamen for eventual sale on my open day. Peter Williams has been very successful with acis which flowered in its second year. My own method is to sow up to 200 ripe seeds in a seed tray immediately on collection and place them outside or in my cold greenhouse. Almost invariably they require the winter cold and germinate in late Winter or Spring. Initially in the unheated greenhouse they complete their first season undisturbed in their tray. 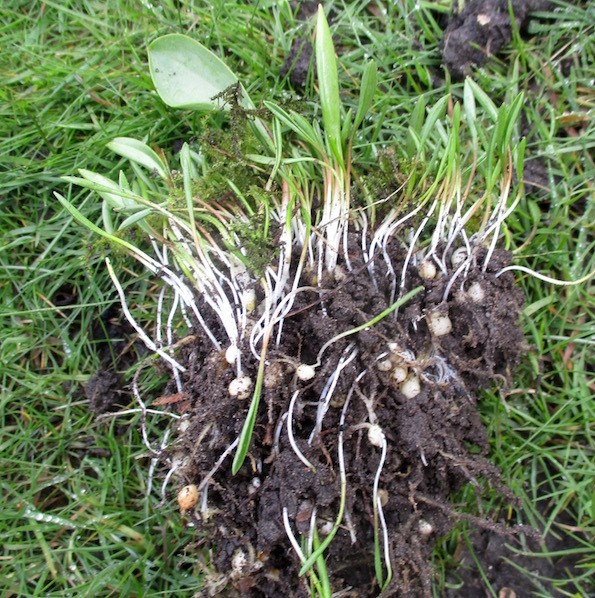 Lets face it many bulbs spread best by vegetative propagation. Many bulbs, corms and tubers are very cheap to buy. Take Anemone blanda. Provided you buy and plant small handfuls of bulbs at the very start of their sales season and after soaking for 24 hours you will have attractive clumps in their first year. After not very many years natural vegetative spread will give you lovely late spring ground cover all over your borders. 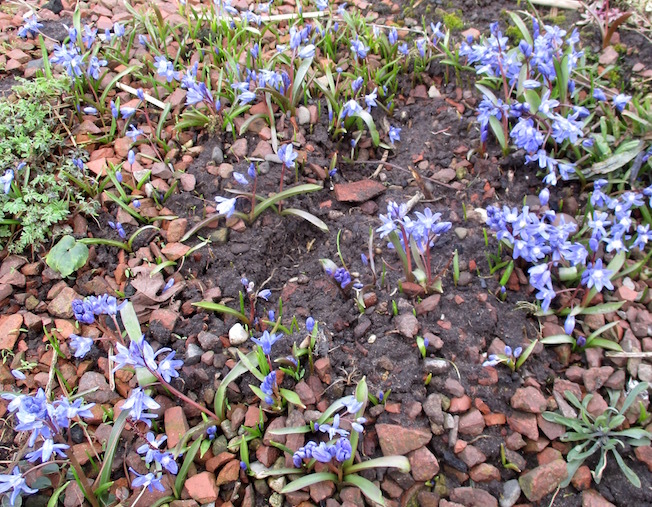 Most dwarf bulbs can without check be lifted and planted ‘in the green’. I do this at any time but it might be best just as they emerge or as they die down. 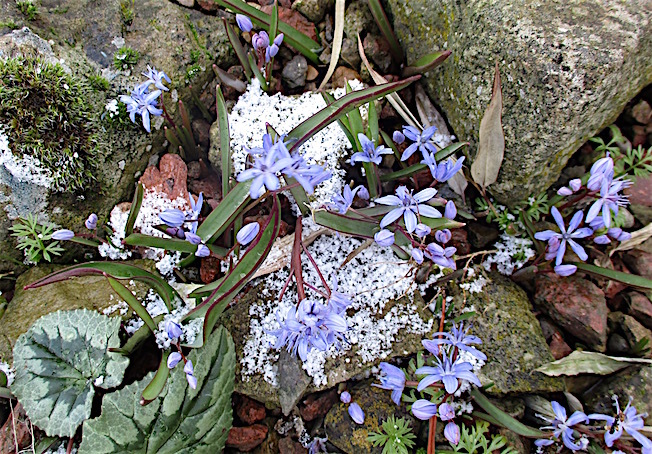 This year in a new project I have been lifting and dividing scillas, chinodoxas, snowdrops, and eranthis in full flower. Use my search box to find my articles about daffodils, snowdrops, hyacinths, ipheons and acis. I have been quite busy transplanting my surplus Cyclamen hederifolium to the village plot, Lyndi's field and Cathi's verge recently Some of the corms are the size of plates -er well small side plates! Ants play a magnificent role in spreading seeds. 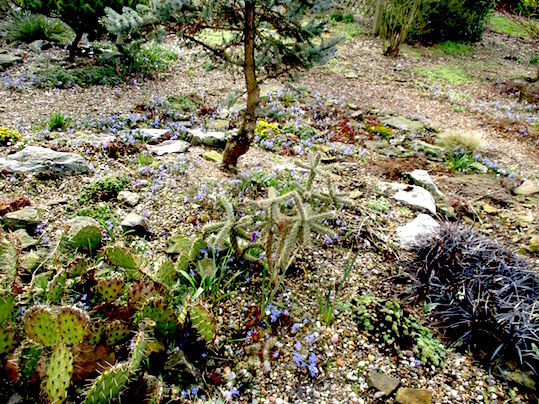 In my last garden the gravel areas were the placed to look for little seedlings. I just recently spotted some fantastic Cyclamen coum in the next village growing in a gravel path in shade. Totally neglected and self sown. Wonderful mass of Winter Aconite. Too bad that Cyclamen are a bit too tender for around here. Do you find that Iris reticulata can be a fast spreader? I agree with what you say here, but some writers here talk about naturalizing in lawns. Our lawns are too mostly thick and get cut early in spring which would remove the needed foliage of bulbs. I have never understood how this could work, unless you stopped mowing the grass for several months? I agree and am adamant that bulbs should not be cut back until leaves are almost yellow and brown! I get round this in my lawn with daffodils by having them in clumps which I can mow up to tightly as illustrated in my daffodil posts. Lawn is normally too great a competitor except for the earliest bulbs such as snowdrops and crocus. 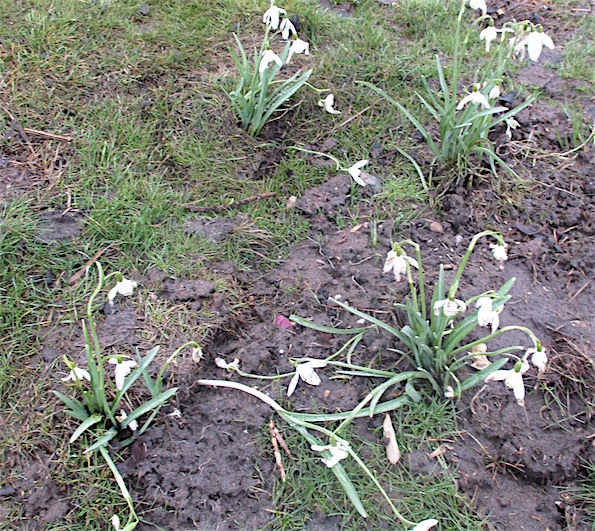 I have not yet written about my recent project planting other bulbs in my lawn! 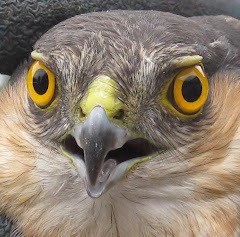 It is based on the hypothesis that only fine Chewings fescue a none creeping grass is allowed. If you read my posts about Cathi's grass verge and Lyndi's field you will find I am getting by with a zero mowing policy but am being utterly ruthless spot glyphosate spraying to tolerate no grasses other than Chewings to get a pure sward of fescue. I have written also how I have achieved this with complete success on the grass paths on the village plot. You won't be surprised to hear that over the last three years I have been constantly re-ordering Chewings fescue seed as I have developed new areas as my new love has developed.